This is not quite a memoir. Rather it is the view from old age. And a view of old age itself, this place at which we arrive with a certain surprise – ambushed or so it can seem. One of the advantages of age is that you can report on it with a certain authority; you are a native now and know what goes on here. In this charming but powerful memoir, Penelope Lively reports from beyond the horizon of old age. She describes what old age feels like for those who have arrived there, and considers the implications of the new demographic. She looks at the context of a life and times, the history and archaeology that is actually being made as we live out our lives in real time, in her case World War II; penny pinching Britain; the Suez crisis; the Cold War and up to the present day. She examines the tricks and truth of memory. She looks back over a lifetime of reading and writing. And finally she looks at her identifying cargo of possessions – two ammonites, a cat, a pair of American ducks and a leaping fish sherd, among others. This is an elegant, moving and deeply enjoyable memoir by one of our most loved writers. "What Lively offers is a series of meditations on memory itself and on what still gives her life purpose: reading and history. Her attitude is rueful but accepting. . .Such briskness, expressing valuable insight and masking deep feeling, will delight all those who love Lively's novels." 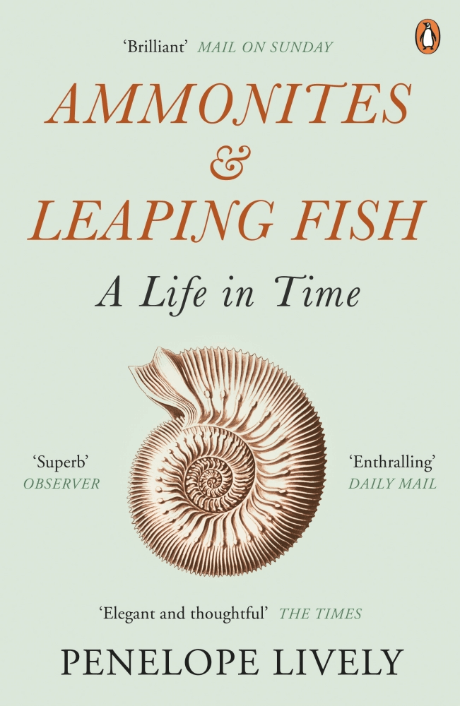 "AMMONITES AND LEAPING FISH is powerfully consoling. Lively is certainly sagacious, her words careful and freighted. But there is girlishness here too. Things still catch her eye, her attention. New books. Old stories. Another day for the taking. " "The book opens with a sharp, unsentimental and ruefully funny account of what it is like, at the age of eighty, to be "in the departure lounge". . . If, as she claims, this enjoyable book "is not a memoir", it is about time and memory, which give us our sense of who we are." "Penelope Lively's fascinating, lucid study could scarcely be more timely. This is not a memoir, she tells us, but "the view from old age". At 80, she is now a native of that country to which no one ever plans to travel, and it is hard to conceive of a more truthful and rigorous reporter." "Like old age itself this book is not for sissies. Luckily for us Lively is one of our most gifted writers." "An elegant and thoughtful dissection of a subject few writers dare to dwell on.. . One of the finest novelists writing in Britain today." "Not a memoir exactly, but rather "the view from old age", Penelope Lively's "life in time" is a reader's pure delight. For starters, the book is a beautiful object in itself, as her books often are." "In the final essay of this memoir, circling her theme in plain subtle sentences as likely to be hymning the disposable fashion of Primark as quoting from Frank Kermode, Lively shares six desert-island objects."